No doubt you remember the episode of Hart to Hart when Mrs H gets kidnapped by the baddie. Held in a room with a glass wall, she uses her large diamond ring to cut her way through the glass to freedom. It is surely the perfect example (note to husband) of just how useful diamonds can be in day to day living. I’m not quite Jennifer Hart but I am still an admirer of a fine piece of jewellery, so I was thrilled to be invited for a private tour of the Cape Town showroom at Uwe Koetter, one of Africa’s leading jewellers. I’d pictured hefty guards and lipsticked smiles reflected in glittering displays but as I walked through the doors it was into a surprisingly calm and relaxed atmosphere. There were displays of course, glowing softly with an otherworldly light in the darkened circle of the room. For a second I thought I’d wandered onto the control deck of a superior being’s spaceship. Rather appropriate, really. Then there was movement and I was greeted enthusiastically by the glamorous but mercifully down-to-earth Bee Lukey who was there not to dissect my brain or even the inadequacies of my inferior life, but to reveal to me a glimpse, perhaps, of how life could be. There were the usual suspects behind the glass – the classic gleaming rings and earrings and pendants with tanzanites and diamonds of every conceivable colour and cut – real Bianca Castafiore bling. But what caught my eye were the pieces displayed on a side wall. These to me were rather more intriguing, more unique – often fantastically imaginative yet really quite wearable. 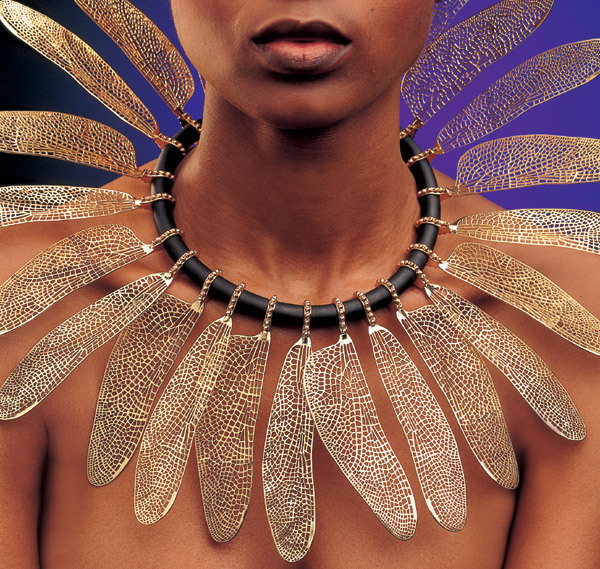 Most impressive of all was a picture of one of head designer Johan Louw’s creations – one of a series of dragonfly-themed pieces, a necklace created from red coral and topaz and diamonds. I drooled over it, feeling a new appreciation of the jeweller as an artist, not just a craftsman. Displayed alongside were the major awards won over the decades and the inevitable wall of celebrity clients. Kate Moss was there and Joan Collins, Joanna Lumley and Nicolas Cage and Stevie Wonder… a pretty impressive line-up. I was guided through the workshop by Johan himself. Given his reputation as one of the most gifted and creative designers in southern Africa, I was ready to be somewhat in awe of him, but he proved charmingly normal. As we padded around, peering over the craftsmen’s shoulders, Johan would pick up bars of gold or intricate tools and explain in his gentle manner how each step was executed. I felt a thrill go through me at the knowledge that I was watching the most valuable metals and precious stones being crafted by some of the finest jewellers in the world. I was witnessing the creation of a piece of art that would, probably one day very soon, mean so much to some lucky person. And of course I learnt a bit about diamonds. South Africa is, after all, one of the greatest exporters of the stones and jewellers here are often asked to give advice to those interested in diamonds for investment purposes. I haven’t invested in the 4Cs myself (the odd Four Seasons pizza, certainly) but the idea was fast gaining ground. Somewhat sycophantically I congratulated him on the dragonfly necklace I had lusted over earlier. Seconds later, Johan had whisked the real thing out of the safe and fastened it round my neck. “Just for fun,” he said, but I think if I’d had more in my wallet than a toffee wrapper and an Essex Library card, I’d have been in serious trouble when I got back home.